At Union Station, Ness and Stone find Payne guarded by several gangsters. While waiting for Payne to appear, a young mother with two suitcases and a toddler in a baby carriage laboriously climbs the lobby steps and Ness eventually decides to help. 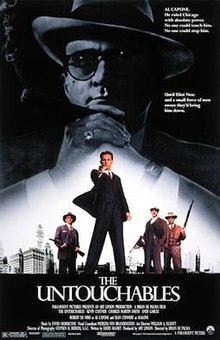 When he's about to reach the top, the gangsters appear, a gunfight breaks out on the steps while the baby's carriage slowly rolls down: Stone stops it with his legs as he keeps shooting down gangsters. Later, when Payne testifies at Capone's trial to explain the untaxed cash flows throughout the syndicate, Ness observes that Capone seems unusually relaxed and also sees Nitti carrying a gun under his jacket.